After your book has been completed, it is packed for shipping. 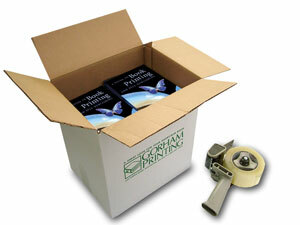 We use 8.5x11x12 inch or 9x12x12 inch boxes, depending on the book size. See the chart at right to determine the approximate weight of each box, depending upon the number of pages and book dimensions. Typically, the boxes for 6x9 books weigh 43 lbs. each and the 5.5x8.5 and 8.5x11 boxes weigh 34 lbs. each. We ship to all fifty states of the United States of America. If you have special shipping questions, you can contact us by sending an email or calling us at 1-800-837-0970. 3. The box size and weight for your book from the chart at right.